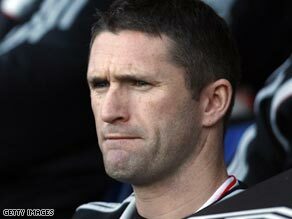 Keane on the way out? Is Robbie Keane ready to leave Liverpool? The future of Liverpool's £20 million man Robbie Keane is uncertain today after he was not at Anfield for his side's 1-1 FA Cup draw with Everton. Various media are speculating that the Republic of Ireland international is hoping to leave Liverpool after he was replaced on the bench for Sunday's game by Frenchman David Ngog. The Daily Mirror says Newcastle goalkeeper Shay Given is all but signed for Manchester City in a £10m move, with officials reportedly meeting Monday to tie up the deal. On Sunday, the News of the World reported that Arsenal are keen to sign Manchester City defender Micah Richards. Richards, an England international, could make the transfer for about £7m. Another Manchester City star, Robinho, is apparently back in his club's town and scheduled to have talks with manager Mark Hughes after his controversial departure from the team's training camp in Tenerife, according to The Sun. The Sun also reports that Portsmouth boss Tony Adams is set to announce a £4m offer to buy Joey Barton from Newcastle. Sunderland's Pascal Chimbonda is believed to have settled his £3m return to Tottenham. And in Italy there's no shortage of talk about David Beckham's possible desire to stay at AC Milan after he scored in the team's 4-1 Serie A win over Bologna at the weekend. If you want to debate what David Beckham should do, whether players should be able to change countries, or tell us how much it costs to support your football team: tell us at Football Fanzone!